In such a violent country like Guatemala it is very interesting how the president decides to put the country in Jesus' hands to try to "solve" the current situation. "This points to the reversal of a trend observed in Guatemala since 2010, when homicides began to slide downwards. The country's national homicide rate in 2009 was 46 murders per 100,000 inhabitants, compared to the 2012 figure of 34 murders per 100,000. Mendoza notes that if this trend continues, 2013 would be the first time since 2009 in which Guatemala would witness an annual increase in violence." "Explaining the Jump in Guatemala's Murder Rate - InSight Crime | Organized Crime in the Americas." Explaining the Jump in Guatemala's Murder Rate - InSight Crime | Organized Crime in the Americas. N.p., n.d. Web. 24 Aug. 2013. In such a violent country like Guatemala it is very interesting how the president decides to put the country in Jesus' hands to try to "solve" the current situation. 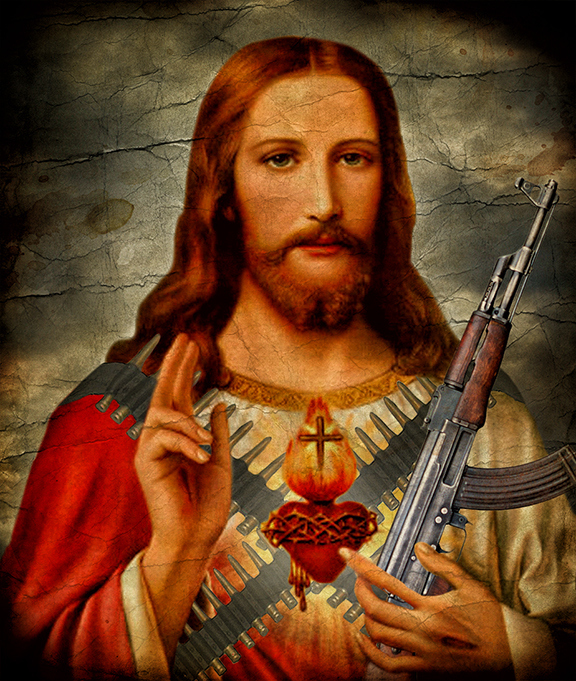 Ak-47 Jesus inspired by Guatemalan President Otto Perez Molina "Today we name Jesus Christ as Guatemala's Messiah and we declare in his name that each one of our generations will be generations that will live in a prosperous Guatemala, and all of us who are here are called to take that path" Otto Perez Molina (president of Guatemala) “Hoy nombramos a Jesucristo como el Señor de Guatemala y declaramos en su nombre que cada una de nuestras generaciones serán generaciones que podrán vivir en una Guatemala próspera, y todos los que estamos aquí estamos llamados a hacer ese camino”. Otto Perez Molina presidente de Guatemala "This points to the reversal of a trend observed in Guatemala since 2010, when homicides began to slide downwards. The country's national homicide rate in 2009 was 46 murders per 100,000 inhabitants, compared to the 2012 figure of 34 murders per 100,000. Mendoza notes that if this trend continues, 2013 would be the first time since 2009 in which Guatemala would witness an annual increase in violence." "Explaining the Jump in Guatemala's Murder Rate - InSight Crime | Organized Crime in the Americas." Explaining the Jump in Guatemala's Murder Rate - InSight Crime | Organized Crime in the Americas. N.p., n.d. Web. 24 Aug. 2013.